Isolkenaf is available in handy felt rolls of different thickness, of 25 kg/m³, and in panels of higher density, 80 kg/m³. It contains no polluting additives. It is a product that can easily be reused and as a result it is fully recyclable even after removal. Isolkenaf is fast and easy to install, making it particularly suited to DIY too. Isolkenaf resolves all soundproofing and thermal insulation problems, whether on walls, floors or for roof insulation. Isolkenaf is ideal in both new constructions and in renovation work. Isolkenaf needs no special treatment when handling, its use is clean without producing any dust. Its excellent features set it among the natural insulation materials of the finest quality. Isolkenaf is composed of fibers of kenaf straight from the cultivation, to which is added a certain amount of polyester fibers for strengthening and a natural fireproof product. Kenaf fibers contain no protein substances and as a result it is not necessary to carry out any treatment against insects, such as moths or beetles. 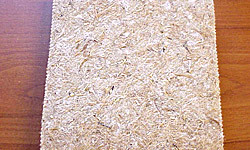 Kenaf products used as soundproofing or thermal insulation materials soon convinced a high number of experts. In countries that are extremely sensitive to the criteria of bio-architecture and green building, it has obtained the certification of "Material recommended for green building". The above data about Isolkenaf soundproofing and thermal insulation material are given in good faith and refer to values obtained from samples of current productions. We reserve the right to modify the technical characteristics or update the data without notice following developments in technology and/or our experience. We cannot be held liable for any use of the product or the above information.